The Elmhurst History Museum will help you create the perfect Father’s Day gift at Days with My Dad: Memory Jars. In this fun activity on Saturday, June 16 (the day before Father’s Day) you and your children can make a one-of-a-kind gift that dad will treasure for years to come. All you have to do is bring a small personal item that has some family significance or reminds you of time spent with your father or grandfather. The museum provides lidded jars and craft supplies to create your memory jar. At Elmhurst Toyota, we think this is a wonderful activity for families to preserve memories and make new ones while honoring dads. The jars created at Days with My Dad: Memory Jars are a special way to create a family keepsake that will be treasured for years to come. Children can decorate the jars with craft supplies to personalize them for their dad or granddad. 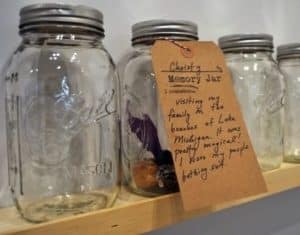 The personal item for the memory jar is placed inside the lidded, decorated jar, and a tag is attached that tells the story of the item’s significance. It’s a simple idea, but the result can hold many cherished memories in a small, portable container. Dad can display it proudly at home or in his office. Imagine dad’s surprise when your children give him this unique, handmade gift. If you’d prefer, the entire family (including dad and granddad) can participate in Days with My Dad: Memory Jars to document family history and have fun together. This activity is sure to fill up fast, so reserve your spot now by calling 630-530-6879. The fee to make memory jars is $4 per jar. June 16, 2018, 10 a.m. to 2 p.m. Call 630-833-1457 or visit www.elmhursthistory.org.